If you’re looking for a definitive, unabridged biography on the three men that carry the Hank Williams name, this is probably not the book for you. 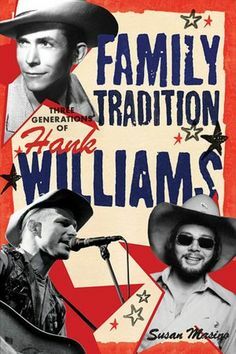 But if you’re looking for a work that for the first time zooms out and looks at how tragedy, women, addiction, fatherhood, and music have played out as recurring themes in these three men’s lives, and how they all intertwine, Family Tradition, Three Generations of Hank Williams should be right in your wheelhouse. The name “Hank Williams” is a blessing, and a curse, and author Susan Masino does a great job illustrating this in a book that is very engaging and enjoyable to read. Instead of consternating about setting down certain hard facts for all-time, she tells the story, and slowly you begin to see how the three Hanks share much more than a name. A good example is each man’s struggle with fatherhood. Hank Sr. died when Hank Jr. was only 3-years-old. Hank Jr. divorced Hank III’s mother when Hank III was 3-years-old, and was barely around for Hank III’s upbringing. Now Hank III tries to break the cycle by trying to prioritize being a father to a son Hank III never met until he was virtually an adult. Hank III granted Susan Masino “unprecedented access” for this book, and though it spends pretty equal time on all three men, because it is the first in-depth print book about Hank III’s life and he was the primary source for original material, Hank III feels like the ever-present curator into the Hank Williams world. New facts are revealed and questions answered about Hank III’s relationship with his father and his record label Curb Records (who Hank III battled for fourteen years), as well as about his feuds with other celebrities like Shooter Jennings and Kid Rock. The book mostly follows a chronological order of their lives, but it’s not afraid to jump around a bit when parallel themes come up in each man’s life. The first chapter is actually an account of seeing Hank III in concert, and the youngest Hank’s observations and stories he’s heard from family over the years are peppered throughout the work. Even if your interest just lies in one or two of the men, this book keeps you interested by the interwoven nature of the story. Say you are into Hank Sr. and Hank III, but don’t care for Hank Jr. By delving into things such as Hank Jr’s relationship with Audrey Williams (Hank Sr.’s wife and Jr.’s mother), or Hank Jr.’s fall off of Ajax Mountain in 1975, or the circumstances around the birth of Hank III, Family Tradition makes you appreciate that you can’t have one man’s story without the other, and how remarkable it is that many of the same mistakes, tragedies, struggles, and successes recur in all three men. The music nerd in me may have preferred a little more in-depth info in a book like this, but it might have been at the expense of a storyline that flows in a very engaging and accessible manner, and most importantly, makes you appreciate and understand the three generations of Hank Williams in a more in-depth manner than before. And props must also be given to the cover, which captures the Hatch Show Print approach perfectly.